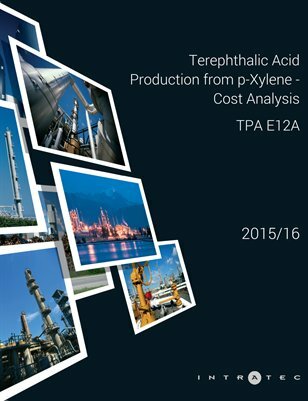 This report presents a cost analysis of Purified Terephthalic Acid (PTA) production from p-xylene. The process examined is a conventional catalytic oxidation process. In this process, p-xylene is oxidized to Terephthalic Acid. The Terephthalic Acid from reaction passes through separation and drying steps and Crude Terephthalic Acid (CTA) is obtained as an intermediate. Subsequently, the CTA is subjected to purification via hydrogenation and PTA is separated as the final product. This study provides readers with key and hard-to-find information regarding a production process technology and its economics, such as a description of the manufacturing process and industrial site installations, plant construction cost breakdown, production cost breakdown, and raw materials consumption figures. It was developed according to a consistent methodology refined by Intratec Solutions, which involves extensive bibliographic research and data gathering/validation, process simulations and robust cost models.